This audiobook plods along with plenty of action in a dystopian setting. There are a number of characters to both like and dislike, although I found myself not particularly rooting for any of them. The story draws to a good conclusion so doesn't leave you hanging for a follow up book. Unfortunately, I found the narrator to be lacking in emotion at some points in the story and this was drawing my attention away from the audio. The reading is clear though and the production quality good. I received a free copy of this audiobook for an honest review from Jess the AudioBookworm. The store was captivating! I wanted to keep listing to find out what happened next. I found myself in the middle of it all fighting along side them and scared of what would happen next but excited to find out!! How do you pronounce 'sword'? There’s quite a bit I liked about this story such as the all the action, the setting, and the main characters. This dystopian setting has the bulk of power in the hands of few, with the majority of people just eking out a living. I especially liked the gladiatorial fights and how some of our heroes rise from the arena. The seats of power are in a few cities that have retained advanced tech. Inhabitants have been told that the surrounding land is uninhabitable…. but that might not be quite accurate, as Cassidy Havok could tell us. Several of the characters can attain super powers by injecting battle drugs, but they go far and above just an adrenaline boost. Honestly, I had trouble buying into this aspect of the story. I have a biology degree, so I had all sorts of questions about these drugs and the crazy powers they gave the characters. I never felt they were addressed. Since this aspect was a huge part of the plot, I was never fully drawn into the story. The main characters were a big plus for me. Of course, I absolutely enjoyed Cassidy Havok. She’s competent and daring and the real hero of the story. Kaden Valens starts off on the opposite side of Havok but a series of unexpected events draw Kaden and his sister Nix into Havok’s world. Action and explosions ensue! Yay! Now I will admit that sometimes I got a few characters confused. Cassidy sometimes goes by Cas. Then Kaden. Then our evil villain Cath. All these names that can sound close in an audiobook. By the end, I had it all figured out – who lived, who died, who the heck Cath was. It’s a fast-paced, action-packed, dystopian romp. Despite the few issues I had with it, I still enjoyed it over all. Looking forward to seeing what the author does next with this dystopian world. 4/5 stars. The Narration: Audra Cook makes a pretty good Cassidy Havok. Since the tale starts with Kaden, I was at first curious as to why the author picked a female narrator for a main male character story, but once Havok joins the scene, the focus really does switch to her. Sometimes the characters voices blurred and the pacing was a little slow. Also, the word sword is pronounced with a W instead of leaving it silent, so that was a little odd. The male characters could use a bit more masculinity. There were no technical issues with the recording. 3.5/5 stars. The story is set in a world with a slave caste system, where some individuals have special powers that make them especially interesting for gladiator-like fights. Kaden, one of the champions meets Cassidy, a rebel that lives in the Wilds, where nothing should thrive, and she tries to convince him that things can change and this sick society should be overthrown. I'm usually picky about fantasy and YA, but I enjoyed this story. The powerful images which the story opens with got me hooked and made me automatically care for the two siblings. There were many details missing in the world building but I found the ideas so interesting and original that I overlooked this. The characters were likable and it was easy to relate to them, even though they were not ultra-developed. With more character development this would have been a 5-star book. The narration by Audra Cook was correct, and her voice was pleasant. There was some differentiation between voices but I found a bit upsetting that Kaden and Cassidy, two of the main characters, sounded almost exactly the same. I found it confusing, especially because one is male and the other is female. It was a good story, well worth a listen. 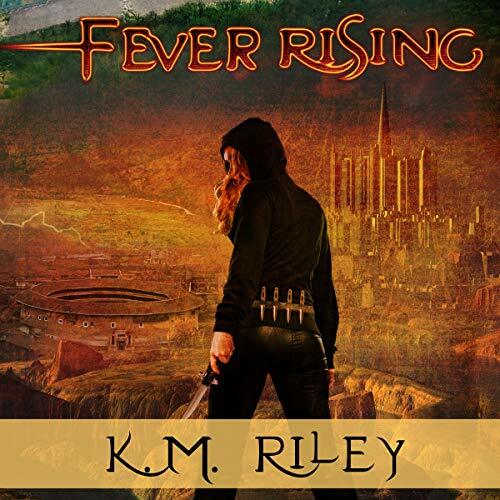 K. M. Riley delivers an interesting new take on the future Dystopian world, one where Oligarchs rule and slave fights are a mass form of entertainment and financial gains for the owners. That said, Dystopian world building can be tedious while the author is trying to craft the rules, the history and provide enough character development and story line to keep things moving forward. Ms. Riley does a decent job once the ball gets rolling. The characters of Kaden, Cassidy and Nix are well done. Kaden remains a steadfast hero throughout the story and Cassidy is his source of intrigue and inspiration as she shifts from foe to ally and back. What this novel does well is delivers action and adventure. The story is well paced and the characters, for the most part, are developed enough for the reader to experience joy and sorrow with them throughout the intensely crafted storyline. There are moments where the plot feels muddy - whether this is a product of underwriting or over-editing is hard to tell when the vehicle is an audiobook. I love the high tech meets old world elements of Fever Rising. The cast system trope is regularly used in the YA and Dystopian genre so that is pretty typical but I thought the sub-sects were clever and I loved the Wilds, the Casteless people and the missions they undertook to rescue Wardens and others with gifts to build Cassidy's army. I also loved that the siblings, Kaden and Nix, had to come to terms with each other as adults and rebels, working together to help save their people when the causal fallout of their defection resulted in the Sirdars and the Prime destroying entire sectors as a message. The narration was truly my least favorite part. At first it was so stilted I thought I had perhaps altered the speed on my app. There was very little inflection, character changes or even modulation for story pacing. It did get better about midway through the story. It was almost as if a different voice actor took over. I have heard Audra Cook read before and think she is quite good overall. This one just falls short for me. Overall I give Fever Rising four (4) Chocolate-Dipped Strawberries. Cassidy Havok rescues Kaden and together they set out to help the to bring the system down. In a world that owns you and can do what it wants with you. Make family members kill each other. Cassidy well, let's just say she is the most resilient character I have come across.